A secure comparison protocol computes a comparison result between private information from inputs without leakage of the information. It is a very important factor in many potential applications such as secure multi-party computation. These protocols under Yao’s Millionaires’ Problem output a plaintext of a comparison result. Because of this feature, however, these protocols are not suitable for some applications such as secure biometrics, secure statistics and so on. From this concern, we focus on a secure comparison protocol whose output is one bit encrypted comparison result. In recent works, the computation of such protocols proceeds bit-by-bit. For this reason, these protocols still have a problem about the efficiency. 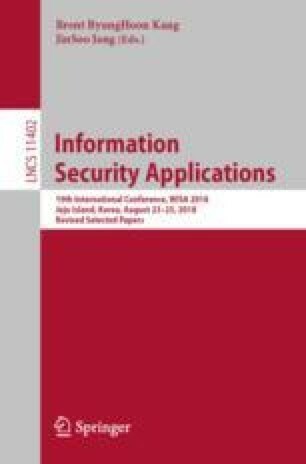 In this paper, as a first step of our study, we propose two secure comparison protocols with encrypted output. As an interesting feature, the computation of one of our protocols proceeds 2 bits-by-2 bits. We prove the correctness of our protocols and estimate the computational cost. Moreover we discuss the security of our protocols against semi-honest model.